This 12" f/4 Astro-Tech AT12IN optical tube is a large aperture and very fast focal ratio reflector that has been optimized for wide field imaging of faint deep space objects. It can be used with 35mm cameras, DSLRs, and large format CCD cameras alike. The standard equipment mounting rings of the 12" Astro-Tech Imaging Newtonian allow you to use it on a wide variety of dovetail plates and German equatorial mounts. Careful note should be taken of the weight of the AT12IN, however, at 40 pounds and nine ounces without mounting rings or finderscope. This scope will require a substantial German equatorial mount under it to provide optimum performance. In addition to deep space imaging, the Astro-Tech AT12IN is also usable for solar system imaging as well as deep space and solar system visual observing. Solar system visual contrast will be somewhat reduced compared to a longer focal ratio reflector because of the AT12IN’s larger secondary mirror that has been optimized for full-field photographic illumination. Visually, the scope should probably be considered more of a deep space “light bucket," rather than a solar system scope. However, the visual performance within the solar system will still be more than acceptable with the proper eyepiece filtration, and the 1220mm focal length of this 12" Astro-Tech makes it quite possible to achieve the high powers needed for detailed lunar and planetary observing. Simply add optional 1.25" or 2" eyepieces, and perhaps an optional Barlow lens, and this Astro-Tech Imaging Newtonian will provide you with crisp and sharply detailed close-up views of the Moon and planets when the seeing conditions are suitable. This Astro-Tech Telescope’s Optical System . . .
Newtonian reflector optics: 12" aperture, 1220mm focal length, f/4 focal ratio. Parabolic primary mirror. Both primary and diagonal mirrors are ground and polished under computer control for guaranteed diffraction limited performance, coated with 91% reflectivity aluminum, and overcoated with a protective layer of silicon dioxide (quartz) for long life. The mirrors are made of B270 “water white" optical crown glass that is free of internal stress and striae. B270 glass is equivalent to BK7 in performance and optical quality. The thermal stability of B270 glass is generally better than the soda lime float glass used for the mirrors of most reflectors in this reasonable price range. For maximum contrast, the four secondary mirror spider vanes have been optimized to be as thin as possible without losing stability. No-tool push-pull mirror cell: The die-cast aluminum primary mirror cell has six hand adjust push-pull collimation knobs. These make it easy to collimate the primary mirror without tools, even while wearing gloves or mittens in cold weather. To further ease collimation, the primary mirror is center-spotted. Built-in cooling fan: A low-vibration/high CFM fan is mounted on the primary mirror cell. The fan is powered by a supplied battery pack that uses eight user-supplied AA batteries. Alternatively, the fan can be powered by a 12 VDC rechargeable battery if one is being used to power your mount’s drive system. Extended optical tube: To increase the contrast, the optical tube of the Astro-Tech AT12IN is extended forward of the focuser centerline to act as a lens shade to keep ambient light from hitting the diagonal mirror. This results in higher contrast than a conventional reflector for both imaging and visual observing. The white-painted 46" long x 14" diameter optical tube is fabricated of rolled steel, to allow the mirrors to cool to ambient temperature more quickly, aided by the built-in cooling fan. While the rolled steel optical tube is somewhat heavier than a more-costly aluminum tube, a Sky & Telescope review of the AT12IN’s 8" smaller brother AT8IN pointed out that a steel tube “also helps make it a very rigid setup, which is a good thing for astrophotographers." In addition, the coefficient of thermal expansion of the steel tube is low, closer to that of a carbon fiber tube than it is to an aluminum tube. This keeps focus changes (due to tube contraction when the temperature drops significantly during an exposure) to a minimum. The scope’s 14.25" o.d. tube end rings are sturdy die-cast aluminum, to protect the tube during transport and provide exceptionally rigid support for the optics. 3.3" dual-speed linear bearing Crayford focuser: The newly-designed heavy duty linear bearing Crayford focuser’s 3.3" drawtube ends in a step-down adapter to a 2" accessory holder. A 1.25" accessory adapter is standard equipment. Both the drawtube’s 2" accessory holder and the 1.25" accessory adapter have non-marring compression ring accessory holders. The focuser has dual-speed focusing. There are two coarse focusing knobs. The knob facing the rear of the scope also has a smaller concentric knob with a 12:1 reduction gear microfine focusing ratio. This provides exceptionally precise image control during critical imaging. All focus knobs are ribbed, so they are easy to operate, even while wearing gloves or mittwelves in cold weather. A lock knob underneath the focuser lets you adjust the twelvesion on the drawtube to accommodate varying equipment loads. A large lock knob on top of the focuser lets you lock in your photographic focus. The focuser drawtube has 51mm (2") of travel. A focusing scale on top of the focuser drawtube is marked in inches and millimeters to make it easy to return to the approximate correct focus when setting up to image or observe each night. Because of the 40.5+ pound weight of the AT12IN (without mounting rings or finderscope) , plus the weight of your ancillary camera equipment and any photoguide scope, installing the AT12IN on a German equatorial mount with a 60 pound or greater payload capacity is recommended, preferably one on the 90 pound payload capacity range. Such mounts include the 90 pound capacity Celestron CGE Pro and the Losmandy 60 pound capacity G11 or G11 go-to and 120 pound capacity Losmandy HGM Titan. Other suitable mounts are also available. For essentially coma-free imaging with the AT12IN, consider adding the Astro-Tech ATCC coma corrector to the scope. This imaging accessory essentially eliminates the coma inherent in all fast focal ratio reflector telescope designs, so that the coma-free star images remain point-like all across the field. Split tube rings: A pair of die-cast aluminum hinged split tube mounting rings are provided. Each ring has a flat boss on its underside with a 1/4"-20 thread mounting hole for installing the rings on the supplied 14" long Losmandy-style “D-plate" dovetail mounting plate. In addition, there is a flat boss with a 6mm metric hole on the top of each ring. This allows you to install a separate dovetail on top of the optical tube for mounting photoguide rings and a guidescope or similar accessories piggyback on top of the AT12IN. The optical tube rotates in its felt-lined die cast cradle rings to bring the focuser and finder to the most comfortable viewing position. Finderscope: 8 x 50mm straight-through dark crosshair achromatic design, in a spring-loaded quick-release mounting bracket. The finder has a long and comfortable 13mm eye relief. To focus the finder, loosen the trim ring behind the objective lens cell, screw the lens cell in or out to focus, and tighten the trim ring to lock in the correct focus. 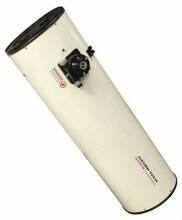 Click the button below to add the Astro-Tech 12" f/4 Imaging Newtonian Optical Tube to your wish list.